Individual house, with 700m of land. First floor, 1 double room with bathroom in-suite (bath, shower, sink and toilet) .1 Double room, 1 room with bunk beds of 1. 90 x 90 each. 1 bathroom with bath, toilet and 2 sinks. With high ceilings of exposed wood, and floor of oak wood, very illuminated with natural light. Bathroom 1 separate bath shower, toilet and sink. Bathroom 2 with double sink, toilet and bath with shower. Downstairs cloakroom with basin and toilet. Excellent holiday home with everything you need for a great holiday. 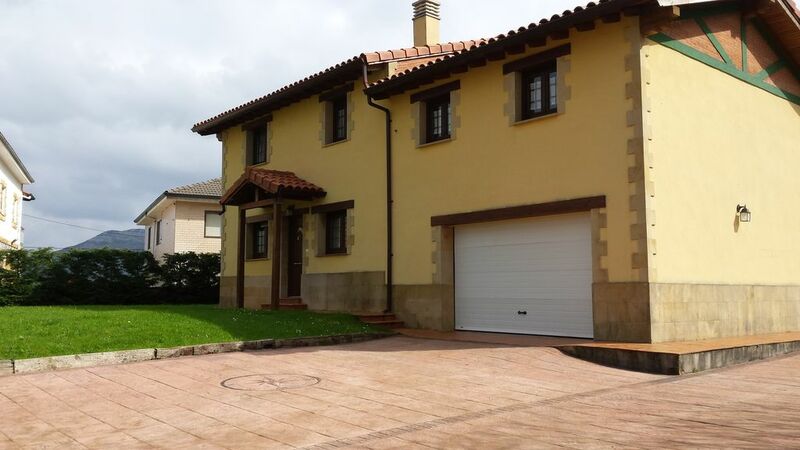 Well located property for trips to Bilbao and Santander. Superb beaches close by and further afield. Allow plenty of time here and make sure you eat here as well as you are spoiled for choice, Alta mira and Gernica. There's too much to take in on a single holiday so you'll have to return as we intend to! Wir waren als Familie vor Ort und sind vollkommen zufrieden. Tolles Haus mit viel Platz - nur die Hunde in der Nachbarschaft sollten nachts weniger bellen. A great place to stay in during holidays! First of all we would like to say that we really enjoyed our stay in spain! There was definitely enough space for all of us seven family members and garden was also great for the children. Another aspect we really liked were the furnitures and the whole design of the rooms in general. The only thing to critizise is that the dishwasher was unfortunately not working properly. We could only use the 20min express program cause otherwise the whole process stopped in the middle. But all in all it was a great place to stay in during holidays! Lo resumo todo diciendo que estamos todos (mayores y niños) encantados con la casa... grande, bonita, acogedora, nueva,..... y encima la dueña muy maja. Nos ha hecho mal tiempo y no hemos podido disfrutar a tope del jardín, si hubiera hecho bueno habría sido ya la pera. Casa completamente nueva y equipada, un lujo poder disfrutarla. Estuvimos 4 adultos y 4 niños. Es una casa nueva y moderna. Totalmente equipada, con cocina de inducción, baños de lujo y hasta nórdicos de pluma. El salón comedor cómodo y amplio. The house is located in a lovely neighborhood of Argoños, little village situated a mile from the beach of Berria, known for his love of surfing, courses, schools ... A 2 kilometers away Santoña fishing village where you can enjoy its rich anchovies and various typical dishes of the region, in a stunning setting with all the amenities of a small town without leaving a village. With good nightlife and variety of pubs and disco bars. A 25kms is the Park of the nature of Cabárceno, an amazing zoo, where animals are in semi to have huge campuses for each species. Perfect for both adults and children visit. Bilbao is a city 60kms and 40kms Santander. With quick access to the Cantabrian motorway. Both towns have ferries, airports and variety of cultural activities.